This home is located within a meadow at the edge of the ocean with spectacular views of Graves Island and the Tancooks. 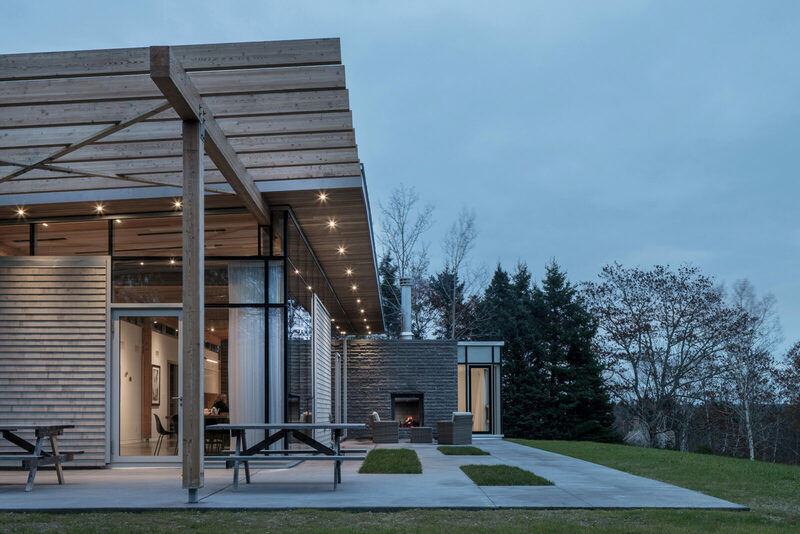 Designed for a retiring couple and their extended family this project is centred around family events and the outdoors. Equally comfortable containing one person or a gaggle of grandchildren this project contracts and expands with everyday life. Consisting of the main house and a guest studio/garage there are glimpses of the dramatic ocean views through the glulam structure that emerges from the interior of the house. Inside the home the dramatic view unfolds along the south and east elevation. The concrete floor extends out to an extensive patio. A stone element housing the indoor and outdoor fireplace stitches the inside and outside together creating indoor and outdoor sitting areas. The north elevation has a service core containing closets, pantry and service spaces leaving the south and east elevations free to enjoy the view. Green roofs, visible from the studio, connect this project to its meadow setting.